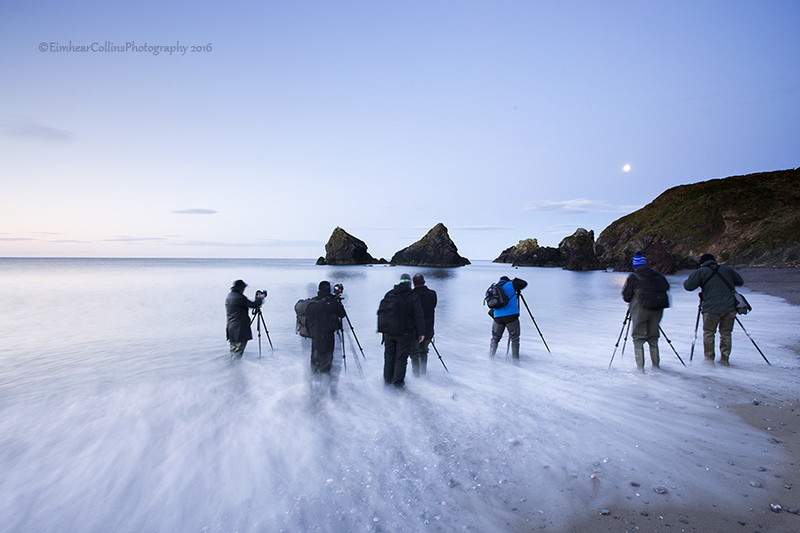 Myself and fellow photographer , Rodney O Callaghan hosted a seascape workshop last weekend down at the Copper Coast in Waterford. The steep slopes on the beaches here are wonderful for capturing great big sweeping backwashes from the receding waves . There are very interesting rock formations and sea stacks too . It is very much Lord Of The Rings style landscape . Kilfarrasy beach, Sat evening 23rd April . 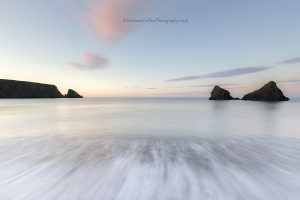 High tide at Kilfarrasy beach was at 19.06pm on Sat 23rd April and sunset was at 8:45 pm… which was a good combination for an evening/ sunset shoot. 7 members from the club travelled down from Athlone . We met up for lunch in Waterford for an introductory chat before the workshop commenced. We headed off then on the 25 minute drive to Kilfarrassy beach. The light was looking promising and plenty of clouds in the sky. We arrived at location around 4:45 pm. After a short talk about safety we set up the cameras and tripods about half way down the beach. Everyone came well prepared for the workshop , with their waders and waterproof clothing. 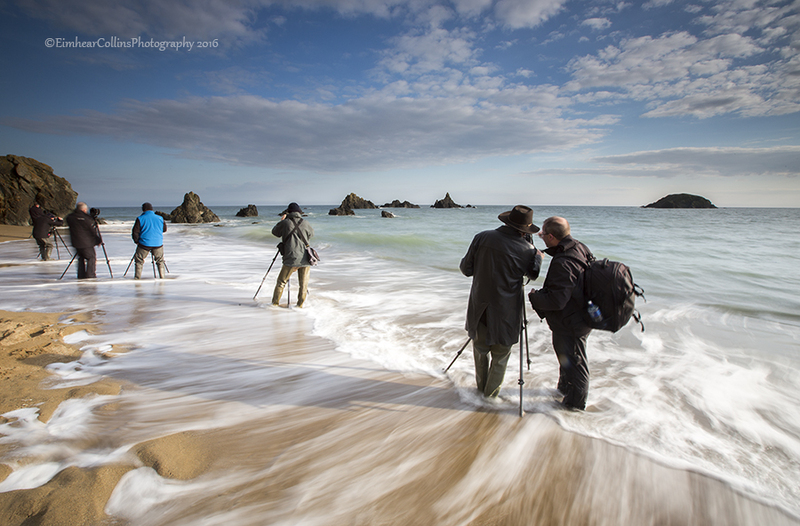 Whilst all the group were very talented and accomplished photographers , most of them were new to seascapes. This was not surprising as Athlone is approx 3 hours from the nearest coastline. We started off by giving the participants some technical information and what settings to use and also explaining how they could get very creative with their images using the filters to both balance the light and slow down the shutter speed . Moon setting at Ballydowane Cove. The emphasis in the workshops is getting everything right in camera , so that in post processing all that is needed is a few tweaks on a single exposure …… so that the image remains “true” to the viewer. Our main concept is that participants learn the art of creating beautiful seascapes. We are not interested in just taking participants to locations to get good images. We want everyone to understand how to make good images, how to read light . The quality of light is what makes a difference between a good image and a great one ! We also show participants how to make the most of conditions that are available. We show and teach the groups how we “see” our own images and our thought process behind them . This is demonstrated by capturing images with our own cameras several times throughout the workshop and explaining what we saw when we captured that image… and what makes that image work. Morning Light at Ballydowane Cove. Both myself and Rodney spent time with each participant, teaching and helping them. We wanted to ensure they got the best possible image from each scene. We ensured they had the correct settings, filters set up properly and that their timing was right.. which is crucial for capturing that perfect backwash or breaking wave. All of the group were eager to learn and each of them quickly grasped the concept & within a short space of time they were capturing images they had aspired to be able to capture. After 2 hours of shooting, we took a short break for refreshments back at the car. Back on the beach then for the sunset, we were treated to a wonderful display of light and colour as the sun dipped below the horizon. It was dark when we finished up that evening at around 930 pm . It was a good evenings work by all accounts and everyone seemed happy with their images. The following morning we were up early at 4am and at our location of Ballydowane Cove shortly before 5am.. Sunrise was just after 6am and high tide at 7:19 am. Again, a perfect combination for a morning/ sunrise shoot. The sea was very calm when we arrived and the skies were cloudless at that stage. The setting moon over the cliffs provided a great photo opportunity for some early dawn shots, with great reflections across the silky water. We were hoping for a few clouds in the sky and were happy to see a pretty pink cloud drifting across the sky just after sunrise. It stood out nicely against the blue skies… The group had to work fast to capture it as the lovely pink colour only lasted a few minutes. The water was very calm, so it was more challenging than usual trying to capture breaking waves , and the receding backwash as we had to be patient and wait for a decent wave to come along !! It was actually the calmest myself and Rodney had ever seen at this location. After a short break for refreshments, we went up to the other end of the beach to the beautiful sea stack. Sea stack at Ballydowane Cove. 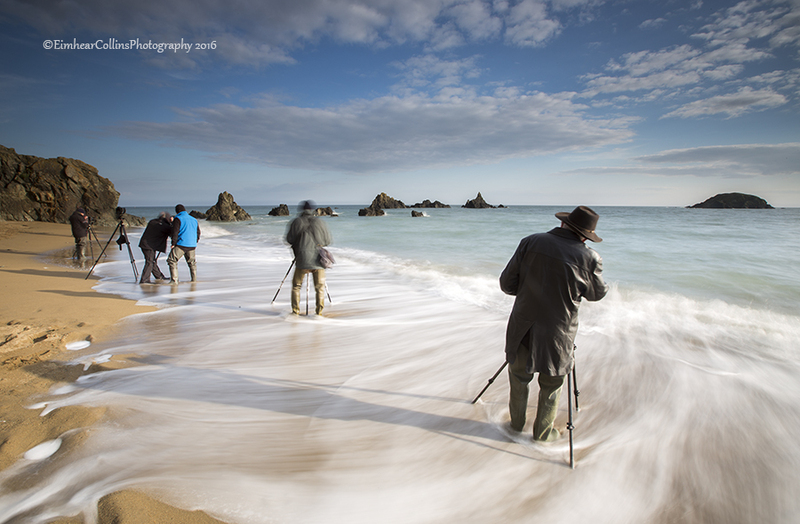 Our timing was good here, as the light was too harsh at the other end of the beach at that stage to continue shooting. The light was softer here, being in the shadow of the cliff. 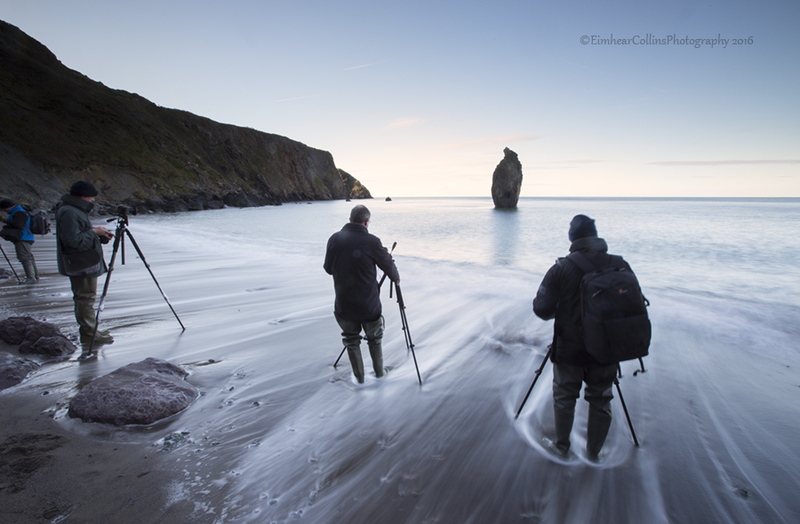 As the water was so silky, it was possible to capture the reflection of the sea stack beautifully in the images. Some nice rocks in the sand made for great images, capturing the swirling backwash making nice shapes around them .. At this stage , each of the participants had fully grasped all that we had been teaching them over the course of the 2 sessions, and were capturing truly wonderful photographs they could be proud of. They demonstrated through their images that they were able to capture so well the power and the ever-changing moods of the ocean … which is what we strove for . With huge thanks to PJ, Mick, John, Rob, Alessandro, Philip and Kevin for joining us on the workshop . We enjoyed the great atmosphere and interaction . It was a pleasure working with you all. Looking forward to seeing some of you at our workshop in Antrim in September .